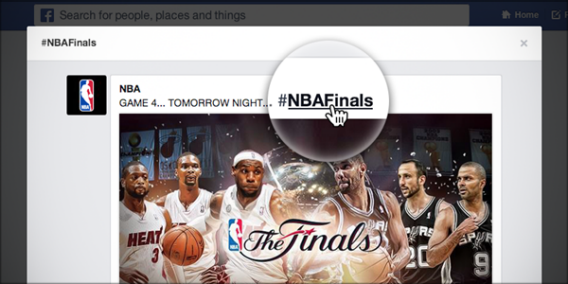 Facebook hashtags: Public conversations give Twitter a rival for second-screen advertising. Facebook Is About to Get More Like Twitter. That’s a Good Thing. Now you can see what everyone on Facebook is saying about the NBA Finals. Facebook is about to get a little more like Twitter, and that’s a good thing. The company announced in a blog post that it is rolling out clickable hashtags, starting today. That means that if you’re composing a status update about how much you hate LeBron, you can add the hashtag #NBAFinals and your post will appear on a searchable #NBAFinals page along with the posts of everyone else who’s watching the game. Why would Facebook adopt a feature that many people consider among the most annoying aspects of Twitter? I explained the financial motivations at some length in a blog post in March, when the Wall Street Journal first published rumors of the feature. In short, hashtags help Facebook’s algorithms understand what its users are talking about at any given moment, which creates golden opportunities for more timely and better-targeted ads. During primetime television alone, there are between 88 and 100 million Americans engaged on Facebook - roughly a Super Bowl-sized audience every single night. The recent “Red Wedding” episode of Game of Thrones, received over 1.5 million mentions on Facebook, representing a significant portion of the 5.2 million people who watched the show. And this year’s Oscars buzz reached an all-time high on Facebook with over 66.5 million interactions, including likes, comments, and posts. But in this case, it really isn’t just about the ads: There are real benefits for users too. If hashtags catch on, Facebook will suddenly be a viable alternative to Twitter for people who want to watch news events and debates unfold across the Web in real time. Facebook may not be as swift or as finely tuned for that purpose as Twitter, but it’s way bigger. Twitter has been working hard to build and dominate the “second screen” economy. With Facebook’s arrival on the scene, it will have to work that much harder. And finally, it means that Facebook users now have the chance for their cleverest and most newsworthy posts to go viral in a way that they couldn’t before, without the help of a lot of influential followers. Instead of being seen by, say, 20 friends, your wisecrack about what just happened on Game of Thrones has the chance to be viewed, liked, and shared by tens of thousands of strangers. That might sound scary, but keep in mind it’s all optional—hashtags don’t change your privacy settings. So if you add a hashtag to a “friends-only” post, it will appear on the relevant hashtag feed only for your friends. Hashtags may be annoying, but they might also turn out to be surprisingly useful on a site that has never offered a good way to interact with the public at large before. The hashtags will be available to a few users starting today, and more broadly in the next few weeks.